Laurier’s annual “3-Minute Thesis” competition took place on Mar. 27, 2019, giving students at both the undergraduate and graduate levels a chance to give an “elevator pitch” summary of their thesis for a chance to compete at the provincial level. Elmarsafy’s research is on the evolution of the water flea and resurrecting water fleas of the past, an insect at the bottom of the food chain that is integral to the survival of many animals. She will be presenting her three-minute thesis again at McMaster University on Apr. 17. “I want to work on my hand movements for the provincial competition and also taking it a little bit slower because I was super nervous and I think I need to pace myself a little bit better, those are two areas I’d like to improve on and I think I can do it,” Elmarsafy said. “It was the first time I had been a judge … there were a lot of different topics, a lot of different backgrounds, but I was absolutely amazed at how everyone did, it was such a constraint only having one slide and three minutes, it doesn’t give you a lot of flexibility in what you can do,” said Tristan long, a professor in the department of biology and judge of the competition. Scott Donald, from the faculty of kinesiology, received the second-place honour for his thesis entitled “Psychological Readiness to Return to Sport After Injury,” being only one of two students from the entire faculty competing in the competition. Victoria Parker, from the faculty of psychology, received the honourable mention for a second year in a row with her thesis “Diverging Definitions: The Consequences of Defining “Feminism Differently” which was a different thesis than her 2018 presentation. “It’s really good practice, especially since it’s a new topic, so I figured it would be an excellent opportunity to refine my pitch and see exactly how accessible my thesis was, especially because both years I was incredibly nervous, I could not sleep the night before and the whole process in having to memorize it and wanting to do it exactly the way it’s written,” Parker said. The competition was judged by many different faculty members across science as well as established professionals in journalism in business, the Students’ Union president & CEO, the Laurier Brantford dean of liberal arts and more. “My experience as a judge was actually a bit different than I expected, I didn’t expect to be so excited by everything. In the end I was so engaged, I came away with this feeling of being so impressed by the breadth of research that is being undertaken by students and how creative and articulate they are,” said Eden Hennessey, research and programs director for the Laurier Centre for Women in Science who was a judge for the competition. 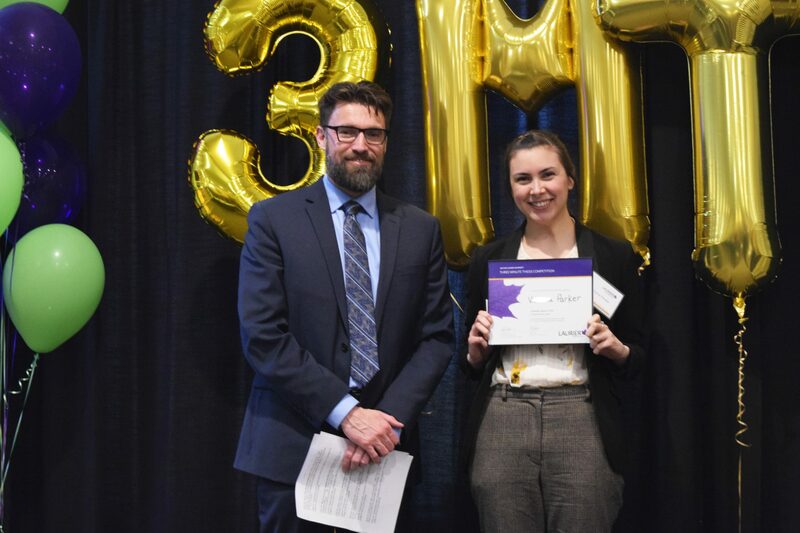 The 3-Minute Thesis competition was also open to undergraduate students for the first time ever, with Leah Mindorff from the biology department receiving the first-place honour, and Brampton Dakin from the departments of geography, geomatics and earth science receiving second.